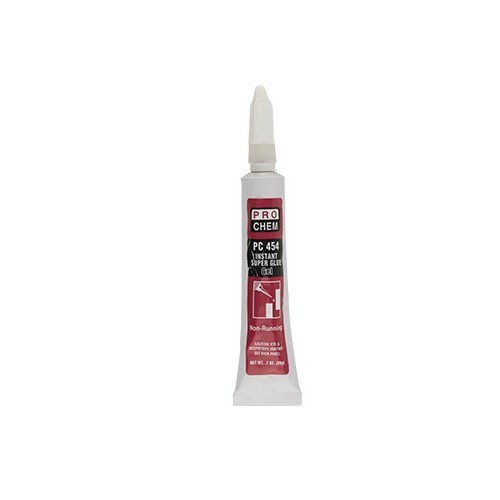 PC 454 | Pro Chem, Inc.
PC 454 is an instant adhesive gel that will not drip or run on vertical surfaces. Provides maximum gap filling as well as bonding difficult-to-bond surfaces such as wood, leather, porous material and acidic surfaces. Ensure parts are clean dry and free from oils and grease. Product is normally hand applied from the tube sparingly to one side and parts are held until fixture strength is achieved. Fixture speed is less than one minute. Full cure time is 24 hours at 68°F. Refrigeration at 40°F provides optimum storage stability.